Location: Uganda is a landlocked country located in East Africa with the DRC to its east, Tanzania to its south, and Kenya to its west. 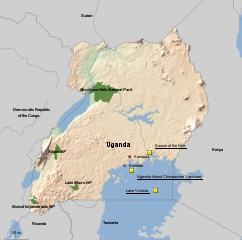 Size: Uganda covers 91,135 square miles, slightly smaller than Oregon, or about the same size as the UK. Population: Around 37 million people live in Uganda. Languages: English is the official language in Uganda, with both KiSwahili and Luganda widely spoken as well. There are over forty indigenous languages spoken throughout the country. The Flag: The current flag was adopted when Uganda gained independence from Britain in 1962. The three colors are representative of its people (black), the sun (yellow), and red (blood). The grey crowned crane is the national bird of Uganda, fabled for its gentle nature. The raised leg of the crane symbolizes the forward movement of the country. Currency: The Ugandan Shilling (UGX) is the local currency, but many luxury lodges and hotels will accept US Dollars. Getting to Uganda: The main point of entry into Uganda is Entebbe International Airport (located near Kampala). There are no direct flight from the US to Uganda, so most vistors will connect with a flight via Amsterdam (KLM), Addis Ababa (Ethiopian), Istanbul (Turkish Airlines), Dubai (Emirates) or Johannesburg (SAA). The border crossing with Rwanda is also easy to navigate if you wish to enjoy gorilla tracking in both countries. Most visitors to Uganda arrive at Entebbe Airport, probably the most easy-going airport in Africa, some 20 miles south of Kampala and on Lake Victoria’s shore. Entebbe became a colonial administrative center at the end of the 19th century and remained the capital until 1962. With its botanical gardens and its old fashioned colonial buildings, it is a charming introduction to Uganda. Golf, tennis, sailing and swimming are available. The Entebbe Wildlife Centre features an open zoo. From Entebbe there are regular trips to Chimp Island. This sanctuary, on a beautiful forested island, is home to chimpanzees illegally removed from the wild and confiscated by the authorities; a raised platform enables close viewing. The tour lasts about half a day, traveling either by a modified traditional Ssese canoe or a faster motor boat. Another delightful excursion is a cruise on the tiny African Queen on Lake Victoria, the boat used in the famous film. Kampala, the capital of Uganda, is spread over a number of hills and takes its name from Kasozi k’impala, “the hill of antelopes”. The city grew around the court of the Kabaka of Buganda. British officials as well as Indian merchants settled on the adjoining hills and so the city’s expansion on its distinct green hills has continued. Kampala remains the heart of Uganda, the center of commercial life and the seat of Government. It is a charming, green city spread out on several hills, with its many gardens and attractive views of the surrounding countryside and Lake Victoria. Hotel facilities range from good international standard hotels, with conference facilities, to accommodation for the more budget-minded. There is also a good choice of restaurants. A tour of Kampala might include the following sights: The Kasubi Tombs – the traditional royal tombs of the Kabakas of Buganda – are a fine example of Ganda architecture; The National Theatre, opened in 1959, offers a variety of plays in English and local languages; The Parliament Building is a symbol of the country’s independence; Makerere University is the oldest and most prestigious university in East Africa; The Uganda Museum has a display of Uganda’s cultural heritage and a fascinating collection of musical instruments. And do not miss the colorful markets, especially the Nakasero fruit and vegetable market, the Owino general goods market and the crafts market. Lake Mburo is one of the newest of Uganda’s National Parks, with a landscape of open plains, acacia grasslands and marshes. Around the lake itself is thicker riverine woodland while much of the rest of the park is acacia woodland. It is a small but interesting savanna reserve within a four hour drive from Kampala. Herds of zebra, impala, klipspringer, oribi, topi, reedbucks, leopard, and buffalo are among the animals that may be encountered, alongside a rich diversity of birds more typical of Tanzanian acacia-savanna, such as the crested crane (Uganda’s national emblem), saddlebill storks and Abyssinian ground hornbills. One of the great advantages of Lake Mburo Natonal Park is that you can walk in the park accompanied by a park ranger. Bwindi Impenetrable National Park covers an area of 190 square miles and is located in southwestern Uganda on the edge of the Western Rift Valley. Designated as a World Heritage Site, Bwindi is a world of towering trees, giant ferns, tangled undergrowth and hanging vines, creating the quintessential equatorial jungle. The altitudinal range of montane and lowland forests at Bwindi support more species of trees, ferns, birds and butterflies than any other forest in East Africa. It is also the only one which contains both gorillas and chimpanzees. Bwindi is home to about 300 endangered mountain gorillas (50% of the world population) and is therefore of critical importance to their continued survival. From this mountain gorilla population, two families are habituated for visitors to trek. Bwindi is rich in other primates, including chimpanzee and blue monkey. Butterflies are the most conspicuous of the rich insect fauna of the park, with more than 200 species. There is also a large variety of trees, a dense undergrowth, an extensive stand of bamboo and a number of swamps. In addition to gorilla trekking, there are a number of nature trails in the park to explore this primeval African forest: taking the course of the waterfall, along the Rushura trail for some sweeping views towards Lake Edward and the Rwenzoris; and to the Mubwindi swamp near Ruhija for some unusual bird species. The extensive Kibale Forest, near Fort Portal in the West, is thought to have the greatest variety and concentration of primates in Africa. Thirteen species have been recorded including the red colobus, the black and white colobus, the vervet and of course the chimpanzee. As a moist forest Kibale is unique, with an extraordinary high diversity of wildlife and flora. Taking a forest walk from Kanyanchu provides a high chance of encountering chimpanzees, several families of which have been habituated. Over 300 bird species have been recorded and experienced guides help to locate specials such as green-breasted pitta, black bee eater, white headed wood hoopoe and the tiny chestnut wattle-eye. Under the ecosystem of a tropical rain forest, as well as its flora and fauna. Dawn walks to watch the chimps waking are quite exciting and noisy. Night walks are good for seeing nocturnals, such as bushbaby and potto. The adjacent Bigodi Wetland, also called Magombe Swamp, offers an unusual habitat for seeing wildlife and birds that live in and around swamps. It is considered to be one of the best guided bird trails in East Africa. The magnificent Queen Elizabeth National Park, located in the western corridor of the Great African Rift Valley, is blessed with a variety of habitats – tropical forest, green meadows, savannah, crater lakes and swamps. Within the park is Lake George, the Kasinga Channel, a waterway rich in wildlife and birds, and half of Lake Edward, home to the largest concentration of hippo in the world, in excess of 35,000 animals. The Ruwenzori Mountains (Mountains of the Moon) act as a backdrop to this park, being the highest mountain range in Africa with the third highest peak at 5,109 meters above sea level. This is one of Africa’s most beautiful and biologically diverse reserves. Lion, leopard, elephant, hippo, Uganda kob, and the giant forest hog are among the big game and birdlife is exceptionally rich. Q.E.N.P. boasts a one day record for birding to be 296 species, with a total recorded population of 565 species….one of the highest in the world. Bird sightings include the shoebill stork, the black bee-eater, kingfishers, raptors and spectacular flocks of flamingos. The launch trip along the Kazinga Channel is particularly rewarding for viewing a variety of game, especially hippo, buffalo, elephant and a vast array of birds. You may also see the famous tuskless elephants that have evolved in response to poaching in the past. Around Ishasha go on the hunt for the famous tree-climbing lions, which lounge nonchalantly in the upper branches of old fig trees. In the Maramagambo forest, a vast virtually untouched woodland area, search for forest game and primates. The meandering Victoria Nile and the dramatic Murchison Falls make this National Park, the biggest in the country, a stunning habitat for wildlife. Murchison Falls was discovered by Samuel Baker in 1864. The 50 meter wide Nile is forced through a narrow cleft in the rocks, dropping down with a thundering roar and a beautiful rainbow. The launch trip to the bottom of the Falls is unforgettable, both to experience this mighty river and to see the huge crocodiles, hippos and birds that bask on its banks. The terrain is dominated by rolling savannah and tall grassland. Buffalo, Rothschild’s giraffe, Uganda kob, hartebeest and waterbuck are commonly seen. You may also spot oribi, bushbuck, Bohor reedbuck, sitatunga, bush duiker, warthog and bushpig. Among the large carnivores, lion, leopard and spotted hyena are seen. The park boasts over 450 bird species including the Goliath heron, Egyptian goose, pelican, bee-eater, kingfisher, hornbill, cormorant, and the rare shoebill stork.